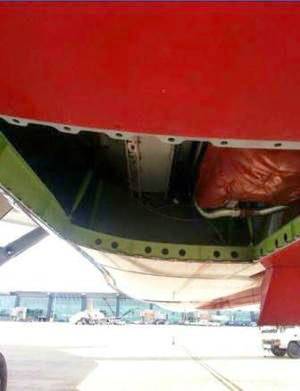 "8x4 ft Panel falls off Air India Dream)liner mid-air"
Bangalore,IN - Oct 15 : A large panel in the belly of a Bangalore-bound Dreamliner of Air India fell off mid-air, putting about 150 passengers on board at a grave risk, but the aircraft landed safely. The DGCA is probing the incident which occurred on Saturday when an 8X4 feet panel in the fuselage fell off while the plane was on its way to Bangalore from Delhi, leaving a gaping hole in the cargo hold, official sources said. There were 148 persons, including the crew, on board flight AI-803 which landed safely at the Bangalore airport, the sources said, adding that the hole was noticed by the ground staff when they came to inspect the aircraft for its return journey. The missing part was taken out of a brand new Dreamliner (VT-ANO), AI's 9th B-787 which had landed here just days back and is awaiting certification to begin commercial flying, and taken to Bangalore. Only after this part was fitted in the aircraft grounded in Bangalore (VT-ANK) could the plane fly again after a delay of almost 10 hours. However, now the brand new "Christmas tree" VT-ANO is grounded in Delhi, awaiting the part from Boeing!